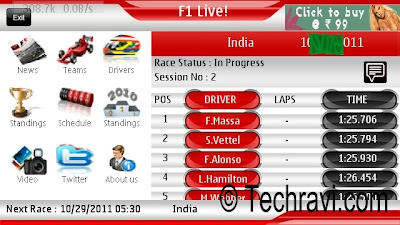 Formula 1 fever in India is catching fast , you can watch live F1 race on your pc in my previous post but you can watch it on the move by visiting official http://mobile.formula1.com/ or using official apps like F1 Live on your mobile. A official formula 1 app is also available for download on Nokia store. * Live Race coverage right from Friday's Free practice sessions to Race day! * Complete 2011 Race calendar with Results. * Comprehensive information of all Drivers and Teams. * Latest Driver and Constructor standings. * Profiles of each circuit from around the calendar. * Last season Driver and Constructor standings. * Latest Tweets from Drivers and Teams on Twitter. * Socialize with our exclusive F1 Fan Forum. Download F1 Live here. Download official Formula1.com 2011 application for Android from Android Market), BlackBerry OS (visit BlackBerry App World), Apple iOS (visit iTunes App Store) and J2ME (visit the Ovi Store). Alternatively , you can download ESPN F1 from here. So, enjoy watching live streaming of 2011 Formula 1 Indian Grand Prix.